So lets get this out of the way from the start, Hotels all seem to have a problem. HEAT! And in the case of the Royal in Bideford in particular room 109 we weren’t able to open the window wide enough to cool it down at all. This lead to both of us having a restless night’s sleep. The breakfast was nice, but what I’d call safe. Anne did have fish and that was good but the full English was nothing to get excited over. Overall these walking holidays have proven time and time again that the friendly service, hospitality and value for money you get from B&B’s far out ways stopping in hotels. This looks like it will be proved again as we arrived at The Village Inn in Westwood Ho! The weather forecast was for a cloudy start brightening up later in the afternoon, and it didn’t disappoint, the only inaccuracy was the fact that it brightened up earlier than expected. So a dull start from the hotel at Bideford but again we determined not to wear coats at the outset. This was a short skip along to Appledore which we made in what seemed double quick time, this is where we tried out first Hocking’s Ice Cream and very nice it was to. Appledore seems to run along and around the Torridge River head, and is a quiet little place and has some lovely little cottages dotted in lots of corners. Before reaching Appledore though we had to take, other than heading inland on the estuary, our biggest detour round and obstacle which was the Babcock Ship Yard. Heading away from Appledore we decided that at no point on this walk where we going to take shortcuts and the Northam Burrows was no exception, and we are glad we did as there were points walking round this point that we could have been on a Caribbean sandy beach it was beautiful. Here’s a 360 that shows it just a little. So if anyone is wondering yes we would do this section of the walk again a lot of people don’t seem to like the estuary section but it brings so many different views and aspects it is well worth the effort. After the Burrows we headed back toward Westwood Ho! with the sun beating down and the tide slowly creeping up the beach, we were able to walk along the beach, but with about ½ mile left we had to remove our boots and walk the last stretch in the rising tide barefoot. We spent two hours on the beach sunning ourselves and enjoying a swim before wandering up to The Village Inn, another cracking B&B, the info indicates that this is one of the oldest buildings in Westwood Ho! and has a very interesting history. We took a stroll along the coast toward The Pier House where we took refreshment (yes yes beer) and enjoyed watching the sun go down, and I have the pictures to show what a lovely evening it was. 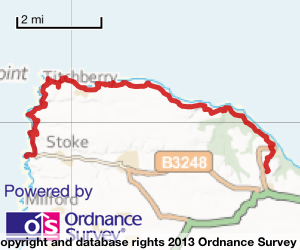 Tomorrow is looking like another wet and a little longer than the last couple of walks at 11.2 miles. 8.1 miles Distance, including extra walks to beaches and to the ends of any points we visited. Tags: SouthWestPath, Devon , SWCP, Bideford, Appledore, Northam Burrows, Westward Ho!